I’ve been running the iOS 5 gold master (GM) for a few days now and I believe it’s close enough to the official software release on October 12th that I can speak about some of my favorite features. Of course, Apple can make changes to the software before it ships out Wednesday so be aware that this post is not talking about final release software. Without further ado, here are my favorite features of iOS 5. Improved notifications: This is the best feature of iOS 5. For as long as I’ve owned my iOS devices, I’ve been annoyed at how jarring it was to receive a notification while on my iPhone or iPod Touch. Notifications completely stopped what I was doing and focused all of my attention on the alert. It was like receiving a pop up ad that required me to click “close” before it went away. Now with iOS 5, notifications are much less intrusive, appearing innocuously for a few seconds as a banner on top of the screen before fading away. You can set preferences for specific applications on how you’d like to be alerted. You can even have the old style of notifications if you wish. While these improvements really make iOS feel more modern, there’s still a lot to be done. For example, if you ignore an alert, it’s easy to forget that it’s in the notifications center because there’s no icon or blinking LED to let you know that there are notifications that haven’t been acted upon yet. The only solution for this at the moment is to obsessively check the notifications center. A nice icon in the menu bar would be an easy solution to this problem. Improved camera features: This is one of my favorite features of iOS 5 because of how quickly you can access the camera application. From the lock screen, double tap the home button to pull up the music controls and you’ll also be presented with a little camera icon to the right of the unlock slider. Tap it and you’re instantly taken to the camera app. If you have a passcode, your photo gallery will be locked from prying eyes. HDR remains as an option in addition to having a grid for toggling grid lines. I love the grid as it helps with photo composition. As for things that Apple can do to improve the camera app, I wish that the HDR feature would be less aggressive. Photos with HDR in dim lighting often result in grainy, soft, and over saturated. 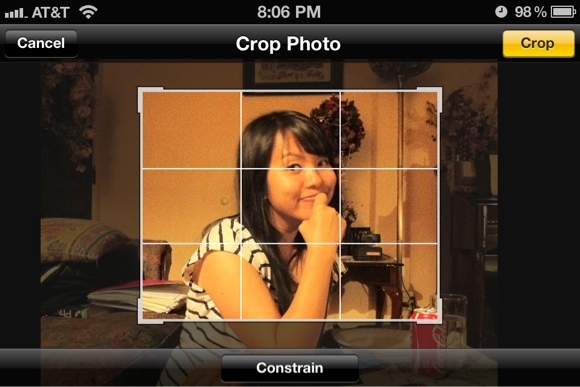 I still use Camera+ as my default app since it’s a camera and editing suite all in one. Performance has stayed the same from what I can tell. Shot-to-shot times were unchanged but post processing seemed a bit faster but performance didn’t stand out. Wi-Fi syncing and iCloud: This is definitely one of the “catch up” features in iOS that tries to match Google’s Android. 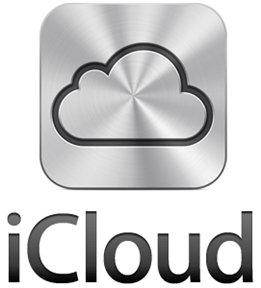 iOS 5 and iCloud are launching the same day, allowing users to sync contacts, calendars, email, settings, and photos to Apple’s servers. Since iCloud hasn’t been released yet, I can’t speak as to how well it works but I can talk about wi-fi syncing with iTunes. You no longer have to plug in your iPhone to your computer to backup and sync your iPhone. Instead, your iPhone will automatically sync and back up your device to your computer as long as they are connected to the same network and your iPhone is connected to a power source, since syncing can drain your battery substantially. Another great thing about this “PC free” movement is that software updates will be incremental and can be downloaded on the device instead of requiring a computer to download and install. Speedier performance: Overall, iOS 5 feels a bit quicker than iOS 4. Even though there are substantial additions in features, iOS 5 runs faster than iOS 4 on the same hardware. 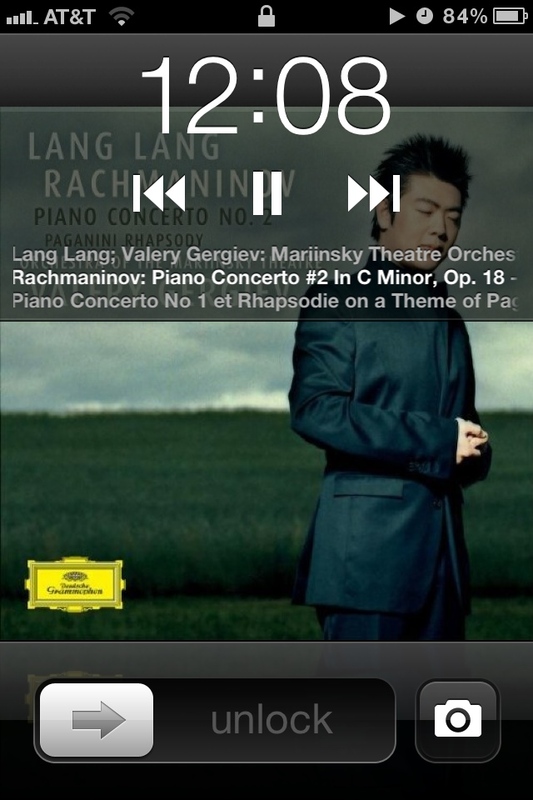 Apple has really done a splendid job of optimizing the software for the phone. I used to run out of RAM a lot with iOS 4, which lead to random crashes. iOS 5 seems to have fixed this and is very stable. Widgets: While there are only two widgets available (weather and stocks) in the notifications center, they are very useful. The weather widget is location aware and will pull up the weather for whatever city you’re currently in. I hope that Apple allows 3rd party widgets in the future. Simple photo editing: There are three editing features that are included in the stock Photos application; auto-enhance, red eye reduction, and cropping. For most users, these features are enough to not have to download an app to handle simple edits. For more powerful editing tools on the iPhone, there’s still Adobe’s Photoshop Express and others. Having these features baked into the OS makes it really user friendly and really helps to make your iPhone pictures look great. 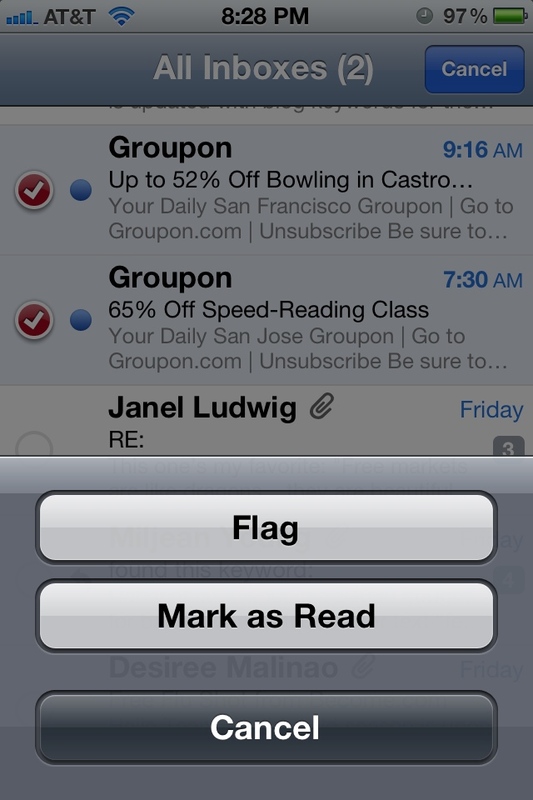 Flagging mail: Last but not least, flagging email has finally arrived on the iPhone. I’ve been asking for this feature since I bought the first generation iPod Touch before the App Store even existed! It seemed like such an easy feature to implement and it’s taken Apple five generations of software to finally roll it out. Flagging really helps with productivity as I am forgetful and like to flag emails to deal with later. Overall, iOS 5 is solid and a great step forward for Apple. While many features are definitely playing catch up with Android, there is a good level of refinement in the OS that Android still has yet to master. 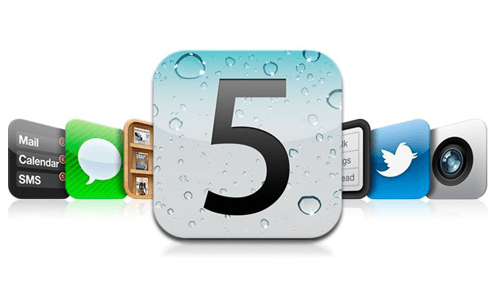 Current iOS users will find iOS 5 a great, functional update. Android users who are planning to switch from Android may miss some features of their phones, namely great voice dictation and tight integration with applications across its operating system. Apple still has a long way to go with integration with non-native apps. One thing I would love to do is tap on an address in Yelp and have it ask me whether I’d like to use Google Maps or Navigon. Maybe in iOS 6. I can dream, can’t I?